Heat oven to 375°F. Mix milk and peanut butter in large bowl until smooth. Stir in Bisquick and vanilla. Shape dough into 1 1/4-inch balls. Roll in sugar. Place 2 inches apart on ungreased cookie sheet. Bake 8 to 10 minutes or until bottoms of cookies just begin to brown. Immediately press 1 milk chocolate candy into top of each cookie. For Zebra Cookies on Safari, use striped milk and white chocolate candies. The peanut butter cookie base creates the desert sand. 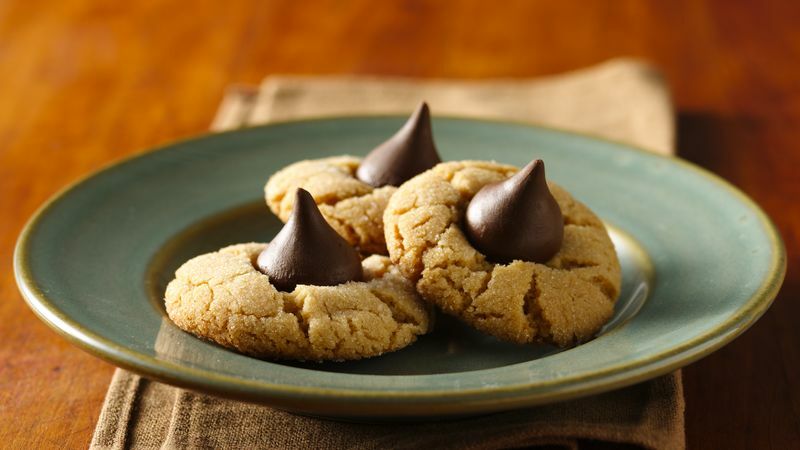 With just six ingredients and 20 minutes of prep, you can have a batch of family-favorite peanut butter blossoms. Who doesn’t love the irresistible combination of chocolate and peanut butter? You can’t go wrong topping rich and creamy peanut butter cookies with milk chocolate candies, or make these cookies your own by topping them with your personal favorite, whether it’s dark chocolate, white chocolate or a mix of both! To make these cookies extra easy, we always like to enlist a helper. Little ones are especially good at unwrapping candies in our experience — though you might want to grab an extra bag of kisses, just in case. Looking for more peanut butter cookie recipes? We’ve got all the recipes you could ever need, plus tips and tricks for making the best peanut butter cookies around.